Stanley Park has changed quite significantly since it first opened to the public in 1888. In my new book Inventing Stanley Park: An Environmental History, I explore some of the major landscape transformations of this relatively small peninsula located adjacent to downtown Vancouver. I found that the greatest landscape changes occurred after it became a public park. Aerial photography can provide some insights into those changes. At first glance, it might appear that the park has changed very little. The peninsula is still mostly forested with a variety of conifers. Its shoreline is mainly intact. The boundary between the park and the city seems to be identical. But upon closer inspection there are several substantial landscape alterations that reveal the complicated environmental history of this urban park. 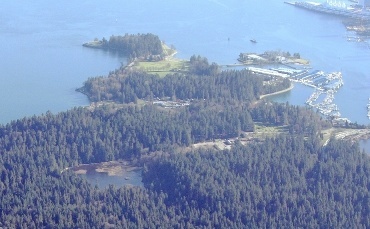 Two of the most evident landscape changes in Stanley Park since 1888 are located on the far west end of the peninsula at Prospect Point. This is the highest elevation point in the park and it overlooks the entrance to the city’s harbour. 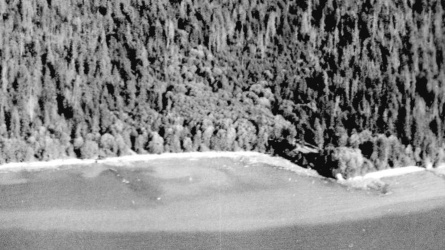 It is also the southern shore of First Narrows on Burrard Inlet. In the late nineteenth and early twentieth centuries, Vancouver city council oversaw the transformation of this part of Stanley Park to facilitate the construction of two key pieces of urban infrastructure, a water reservoir and the Lions Gate Bridge. In 1889, the Vancouver Waterworks Company completed construction of a freshwater pipeline from the Capilano River that ran beneath First Narrows and through Stanley Park. After a shipping accident severed the submerged pipeline at First Narrows, the company built an emergency reservoir at Prospect Point. In 1905, the city expanded and upgraded the original reservoir. Then in 1946, after the Greater Vancouver Water Board replaced the Prospect Point reservoir with one at Little Mountain, the Park Board filled and covered the old reservoir transforming it into a baseball diamond. The other major transformation of the park that is evident in this image is the construction of the Lions Gate Bridge and the Stanley Park causeway connector. Between late 1936 and 1938, private developers built the bridge and roadway, following a contentious citywide plebiscite. The causeway connector slices through the centre of the peninsula on a gentle curve that was previously covered by roughly ten acres of forest. Beaver Lake, Brockton Point, and Deadman’s Island have each experienced substantial landscape change. The vegetative cover, depth, and surface area of Beaver Lake have all been subject to numerous modifications. The Park Board first sought to improve this small body of water in 1911 following complaints that it was an unsightly tangle of fallen trees, marshes, and mud. The area around Beaver Lake was often flooded by its namesake beaver population that formerly inhabited the lake. Beaver dams flooded the pathways near the lake and drowned the forest cover in the surrounding area. Beginning in 1911, the Park Board drove the beaver out of the area and constructed embankments around the lake to prevent the water from flooding the forest. The board also supported efforts to use Beaver Lake as a fish hatchery for sport fishing in Stanley Park from the 1920s to the 1940s. Brockton Point was once home to several families who lived in a settlement that pre-dated the establishment of the park. Their houses, which are just slightly visible in the above photo, lined the northern and southern shores of the peninsula. In 1925 the Supreme Court of Canada ruled that these families were illegal squatters. The Park Board and City Council later evicted most of the families in 1931. Tim Cummings was the last person to live in Stanley Park. The Park Board permitted him to remain in his cottage at Brockton Point until his death in 1958, after which the board destroyed his house and seeded the land with new trees. 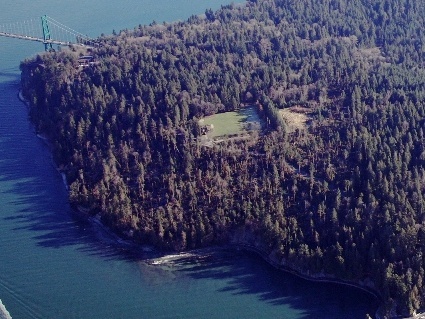 Today Deadman’s Island is known as HMCS Discovery, a naval base located outside the boundaries of Stanley Park. From 1899 to 1930, the small tidal island was the subject of an ongoing controversy between the city and the federal government. In 1899, the federal government leased the island to an industrialist named Theodore Ludgate who intended to build a sawmill on site. 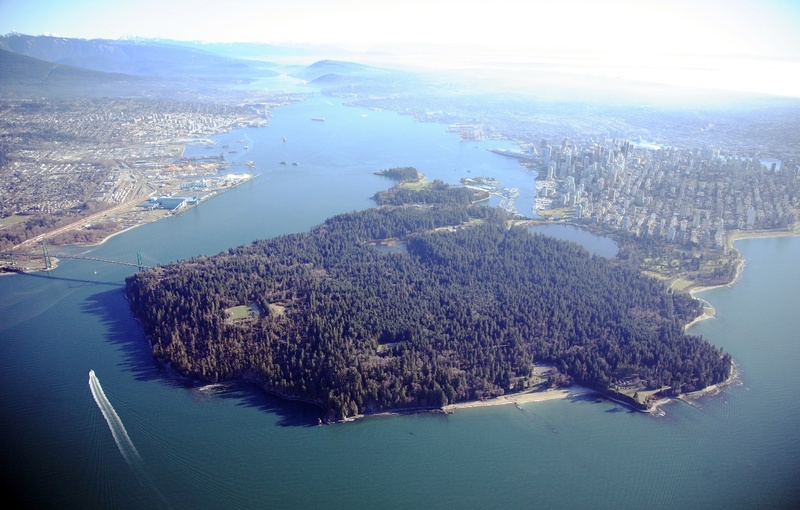 The city and Park Board had previously assumed that the island was part of Stanley Park. With the help of the provincial government, the city unsuccessfully fought the federal government in court over control of this island. 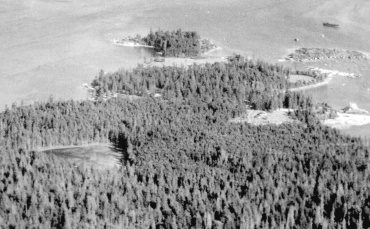 In 1906, the Judicial Committee of the Privy Council upheld Ludgate’s lease to the island and therefore authorized the clearcutting of the forest that once stood on Deadman’s Island. In 1942, the Department of Defence seized Deadman’s Island for naval training during the Second World War. It built several structures on the island and replanted some trees around those buildings. People have also substantially reconstructed the areas of Third Beach and Ferguson Point. 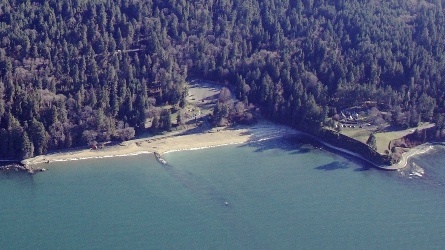 Today, this is one of the most popular parts of Stanley Park, known for its bathing beach and the Teahouse Restaurant. This area shows most vividly the impact of the construction of the seawall, which now encircles the entire park. The Park Board also built up Third Beach throughout the twentieth century, dredging sand from English Bay to create the beach shoreline. 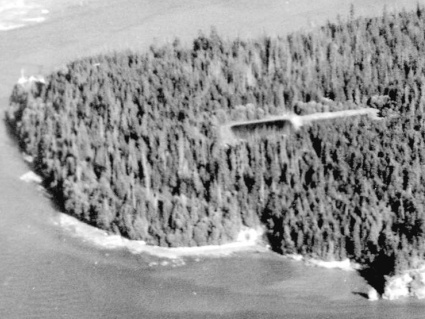 The military cleared away much of the forest around Third Beach and Ferguson Point for defence installations in the late 1930s and early 1940s. In 1939, the military installed two six-inch guns at Ferguson Point aimed out over the entrance to Burrard Inlet and English Bay to guard against potential naval attacks. It also constructed barracks nearby that the Park Board later converted into the Teahouse Restaurant. Aerial photography offers historians an important visual tool for analyzing landscape change. However, not all transformations are visible in photography. While the forest of Stanley Park appears to be unchanged between these two photographs, it was in fact blown down, burned, and replanted many times over the course of the twentieth century. Textual documents and other historical sources continue to be vital to environmental history research. In combination with visual sources, they help reveal the history of natural landscapes that may not be apparent at first glance. 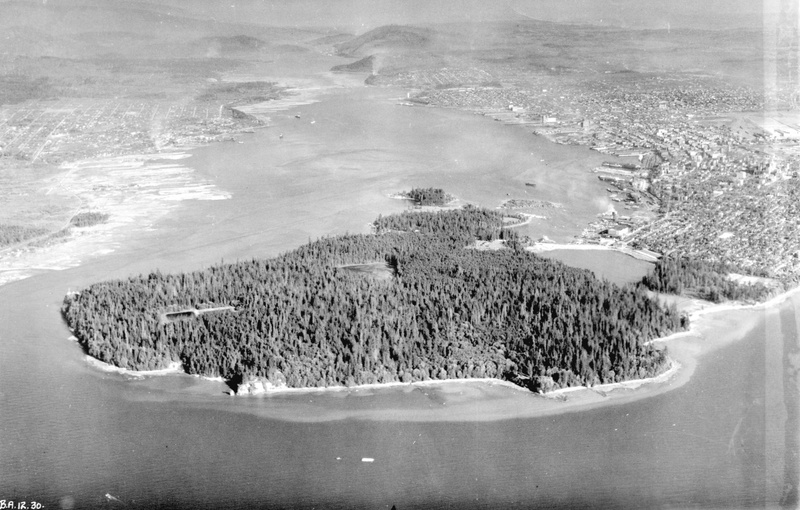 For more on the environmental history of Stanley Park, see http://inventingstanleypark.com.